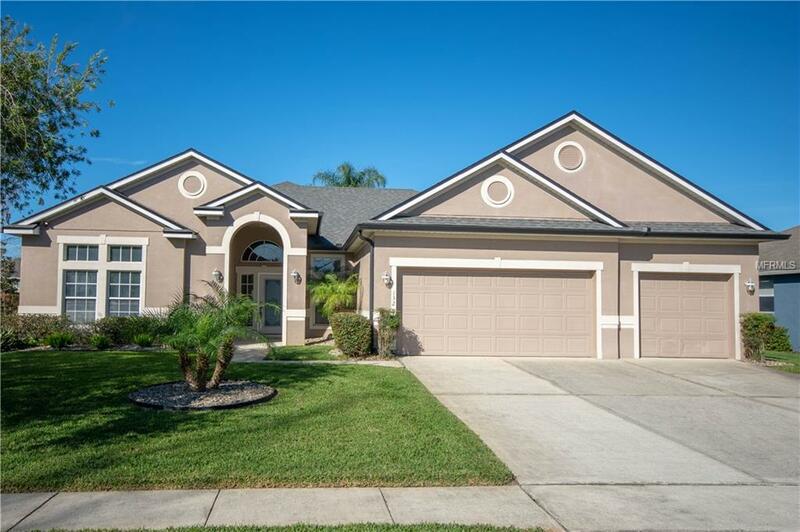 Located in the Gated community of Saxon Woods, this Executive 4 Bed/ 4 Bath POOL Home offers a 3 way split, GREAT ROOM, Huge Patio for Entertaining & BRAND NEW ROOF! Enjoy the outdoors in the SOLAR heated pool during the day, relax at the COVERED PATIO or a view of the stars from the HEATED SPA overlooking the serene backyard. Youll be impressed at arrival from the lush & easy to maintain landscaping. Upon entry, the TALL CEILINGS are alined with crown molding leading to a straight view to the pool & patio. A bedroom, bathroom & office is located just off the foyer. Youll love the Ceramic TILE & Waterproof VINYL WOOD floors throughout the whole home! DREAM KITCHEN: 42 CREAM CABINETS with Espresso glaze, Baltic Brown GRANITE counters, ISLAND, HUGE Breakfast Bar with room for storage, STAINLESS STEEL Appliances including a DOUBLE OVEN range & pantry. Tucked in the back is the Breakfast Nook spacious for a large table. The Family Room features built in cabinets & shelving to display your personal touches. The Master Retreat is located in the back of the home. Master Spa has DUAL SINKS, luxurious Free Standing TUB, separate SHOWER & huge WALK-IN Closet. Down the hallway are 2 Bedrooms, 2 storage closets, bathroom & utility room. BONUS: Water Softener, dedicated POOL BATHROOM, storage closets & more! Saxon Woods is a gated community featuring a community pool, playground & beautiful scenery. Close to I-4 for an easy commute. Just down the street from many restaurants, great shopping & Advent Hospital.